Ashmit is a 6 year old boy. Ashmit's mother left when he was 3 years old. He lives with his father and 2 llittle brothers in a simple dwelling attached to the farm where his father labours. In addition to this accommodation, his father earns $10 per day for planting and picking vegetables. The family has no furniture other than a bed they share. The boys father is committed to his boys attending school and would like them to achieve something in their life. 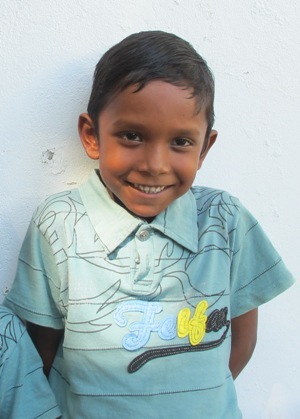 Ashmit enjoys attending school and his favourite subject is maths. When he is not at school he loves to play soccer, reading story books. Ashmit travels to school each day on foot walking around 1.5km each way. When he grows up, Ashmit wants to be a school teacher. The family is financial unstable. Mr Prasad is finding difficulty in looking after 3 children alone. Ashmit is well mannered and dedicated in his studies. Ashmit is currently seeking a sponsor.